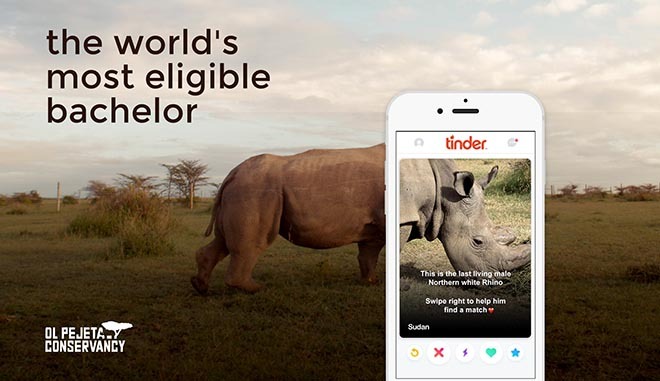 Ol Pejeta Conservancy has partnered with Tinder to launch a new campaign to raise awareness about Sudan, the World’s Most Eligible Bachelor. Sudan is the only remaining male northern white rhino on the planet. The goal of this campaign is to raise the $9 million needed to protect the northern white rhino from extinction. When Tinder users ‘swipe right’ on Sudan’s profile, they will be directed to a page (www.olpejetaconservancy.org/most-eligible-bachelor/) from which they can donate towards this cause. Sudan is not only The Most Eligible Bachelor, but he also boasts a pretty impressive profile. Not only is he a pretty fine specimen of a rhino, but he has his own personal team of armed bodyguards, and has appeared in a string of international documentaries and news stories. Sudan lives his bachelor life at Ol Pejeta Conservancy with his two female northern white rhino counterparts, Najin and Fatu. They have been unable to breed naturally due to a range of issues including old age. However, there are 17,000 other potential female southern white rhino suitors. 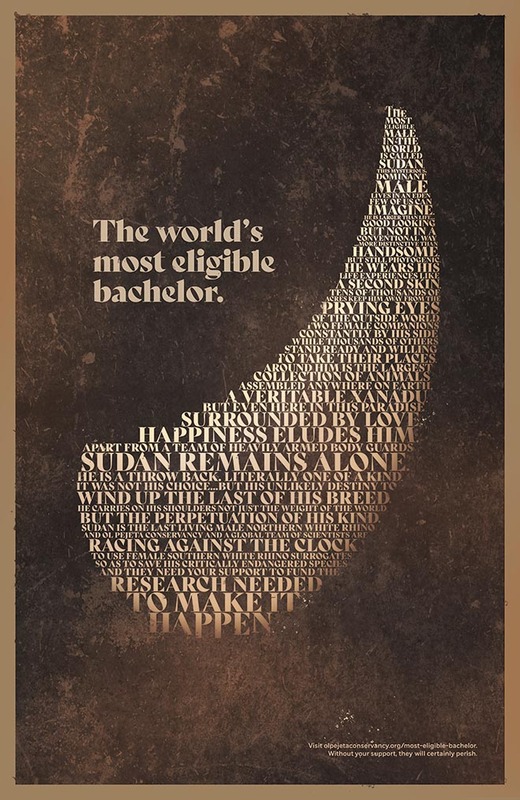 The World’s Most Eligible Bachelor campaign, launched in April 2017, includes posters, print advertising, branded t-shirts, as well as a short documentary film. “The plight that currently faces the northern white rhinos is a signal to the impact that humankind is having on many thousands of other species across the planet. Ultimately, the aim will be to reintroduce a viable population of northern white rhino back into the wild which is where their true value will be realized,” Said Richard Vigne, CEO, Ol Pejeta Conservancy. The funds raised will go towards ongoing research into Assisted Reproductive Techniques (ART) by a consortium of institutions. Once perfected, this technology, in particular in -vitro fertilization (IVF), will aid to achieve successful pregnancies to gradually build up a viable herd of northern white rhinos. If successful, this will be scientists will have carried out artificial reproduction in rhinos. The research, which is currently ongoing in the United States, Germany and Japan, aims to establish a herd of 10 northern white rhinos after five years using in-vitro fertilization. The results have been encouraging. The site crashed an hour after the launch of the campaign. There were 2 billion impressions in the UK in just week. 2 million people right swiped on Tinder. The World’s Most Eligible Bachelor campaign was developed at Ogilvy Africa by regional creative director Joao Espirito Santo, group creative directors Alemu Emuron, Maxwell Ngari, Shashank Jha, creative partners Kwame Nyong’o and Robert Osano, regional managing director Mathieu Plassard, agency producer Heeral Gandhi, Ogilvy North America vice chairman Chris Wall, worldwide design director Sid Tomkins and designer Peter Hahn, account director Catherine Karongo and PR producer Naomi Mutua, working with Ol Pejeta Conservancy CEO Richard Vigne and marketing consultant Elodie Sampere, and Tinder director of international communications Agnes Gomes-Koizumi. Programming was by Vimal Kaul and John Nguru. Photography was by Churchill Oele. Filming was produced at Black Bean Productions by film director James Suter. Sound was designed at Supersonic Africa by sound engineer Sean Peevers, producer Thomas Kalume and project manager Muna Chuba.